I made it! 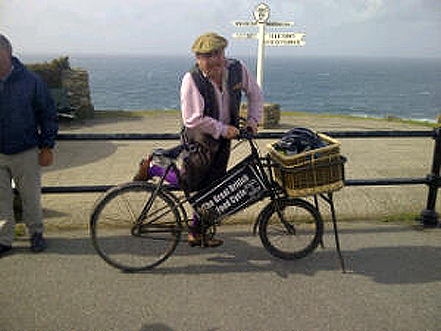 I arrived in Land’s End just after 2.04pm to sign the End2End register in the Land’s End Hotel foyer. The weather was very windy, but the aspect was manly blue skies. I stopped on my way on the quiet country lanes (off the main route which is very busy with sightseers) to harvest some excellent sloe berries. Plenty of people at the tourist attraction, that is Land’s End. My cousin and his girlfriend arrived to congratulate me and I had a pint of Cornish cider in the Land’s End Hotel to celebrate. More news once I’ve gathered myself, and overloaded the washing machine. A big thank you to all who have assisted and made it all happen. Thank you to Betsy who was the best companion I could have had. The climb out of Boscastle is tough. My guide from the YHA showed me a completely straight route out of town. Not the route I took in two days ago. The snaking chicane down to the harbour side. this is a winding road, straight up the hill side. It’s the old high street and it is one on the most consistently steep roads I’ve climbed. Especially as much is wet and leaf strewn. Do not confuse this with the holiday makers roadway. within 5 minutes of leaving the water’s edge, and walk the wrong way up a one-way street, you know you are in for a great slice of Cornwall. The road climbs steeply past tiny stone cottages and a miniature primary school to cross the main drag and carry on up and over the bluff. as you top the rise you are momentarily afforded a couple of magnificent panoramic views above the bay and surrounding farmland. I glimpsed it between dense sea mist. As it rolling in and soaking me. No that I wasn’t soaked in sweat by the crest. The standard switchback road is about 2.5 miles and this rough metaled single track takes just over a mile. Be ready it’s 40 minutes hard push for a heavy bike without gears. Drenching my shirt and dripping off my chin the sweat was chilled by a brisk south westerly. Pleasant for ten minutes. As the highland is reached my mobile phone chirped in surprise, having had no signal for two days. Clearing the messages and data I moved on against the wind. My destination was Padstow, only about 25 miles as the crow flies, but of course I wasn’t planning on traveling the easy route. My route was double the distance by leaving the A39 as soon as possible & traversing the cycle routes, connecting with the Camel Valley and visiting some of the finests area for vineyards, along what was a Victorian tramway. Now a lush and winding leisure trail. However much of the trail you enjoy, it’s beautiful scenery weaving along side the River Camel with numerous attractions in easy reach it’s a great places to visit. Please excuse the lack of posts in the last week. I have had difficulty getting to create posts after a long day cycling. Across Devon and now Cornwall signal strength is mixed. More important, after 8 hours cycling, often against tough weather the last thing I’m thinking of is blog posts. I want to hang my sodden clothes to dry, quaff a local pint of beer, devour a home-cooked meal and slip between dry bed linen. 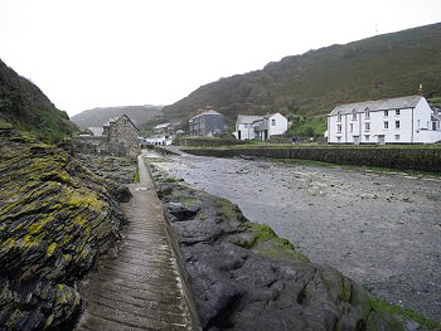 All these I have found in Boscastle on the North Cornish coast. Tonight I’ll be staying at the YHA which is famous as the building most photographed during the floor of 2004. Completely rebuild in 2005. After 440 million gallons of water passed through the coastal village after a once in 400 year event happened due to flash flooring. I treated myself the luxury of a melt-in-the-mouth cornish cream tea, and it was superb. I’m held up in the Cobweb Inn battling with their wi-fi (well that’s my excuse) in the hope that I will get this message in a bottle out. Of course I didn’t come to Cornwall for the information superhighway, so alas, you’ll have to wait till I finish my pint of Castle Gold and find somewhere that has a signal. 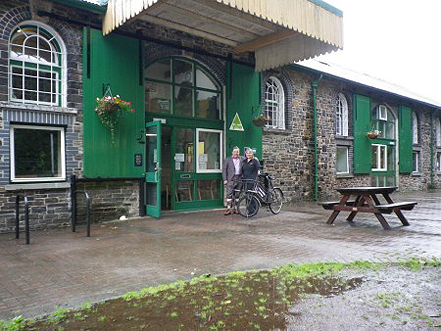 Okehampton YHA is an awesome activity centre for youngsters. Very long day against the wind, very tired. Picked up from Exeter Brewery. Award winning micro brewery on the marshes of Exminster. long arduous climb to Okehampton. Arrived in darkness and rain. More info to follow. More on my visit to The Magdalen Project when I have an opportunity to sit down and write a full account of a great visit with this incredible organization. Creating opportunities for schools, young people, and individuals wanting to learn about where food comes from. In the morning I was dragging my feet to pack my bags as it was very heavy rain. Luckily my check-out time was mid-day as the rain stopped mid-morning and I was out the door as it stopped. Heading first to Henley-on-Thames and then down the Thames Path towards windsor. Through Twitter I had arranged to drop off some sourdough starter in Henley, to a buddy of @joannacary I will have to wait and see if what she makes? Keep me posted Jo, I’m expecting a decent sandwich soon! It was quite a big dog-leg to get back to Windsor. Really not fun, so i missed portions out, and used the road. In Windsor I stayed at Oscar Lodge, which i found as budget accommodation online. It was simple, beautifully clean and just what i needed. The gentleman on reception directed me to The Vansittart Arms a Fullers pub, I arrived freshly showered and ready for a pint and some home cooking. I wasn’t disappointed. In west Windsor there seems to be an awful lot of puds in the surrounding suburb. I counted 4 on Vansittart Road which is not a long road and as I walked a couple of blocks to familiarise myself with the suburb each road had a pub. I’m guessing Victorian residents of west Windsor were a thirst lot? Dinner at The Vansittart Arms was excellent pub grub, I had Chicken & bacon in a cream sauce over excellent spaghetti. Just what the doctor ordered. Plenty of carbs & protein, with a pint of Fuller’s Discovery which was well conditioned. In the morning I was dragging my feet because it was pouring with rain, yet again. in the background I was looking forward to cycling part of the Thames Path and getting a few great views & making it back to London and a hot shower in my house. But that was many hours away. The cycle path out of Oxford as you might imagine is excellent. I was well on my way. I wanted to try following part of the Thames Path and I got a good distance when i realised my rear tyre was going down. I jumped off and began to push asking a couple of locals as i walked were they suggested I found a bike shop. It looked like at least an hours walk with no guarantee of being fixed. As I walked after a while I saw a rural train station and decided to potage the bike a couple of stops to town were I’d find a bike shop that could help. I arrived in Reading without realising it was Reading Festival weekend. The forecourt of the Station was completely packed with students and other revellers. The denim mini short and jazzy wellies seem to be festival fashion this year. it was almost 5pm and I needed a bike shop that worked late and somewhere to stay. I was very lucky to find Action Bikes at 15 West Street and went to ask them if they could help. Immediately they went to work on helping me. I really have to thank Simon and his wife for going way beyond the call of duty, as Sim’ went to work in finding an unususal inner tube size and strip down the rear wheel and his wife ran down the road to ask at the local pub The Horne if they had rooms above the public bar. I was in luck, amazingly she was able to secure me a room at the right price even though The City was packed with people heading for the festival. All I had to do was find and evening meal and breakfast. Simon talked to the owner of the bike shop and I was allowed to leave Betsy locked at the bike shop, much safer than outside a downtown pub. Not that anyone will steal her, just try and ride her or mess with the seat or basket cage as the bike is so unusual. I stayed at The Horne and it was fun dealing with a 17th century building. The floors were the most uneven I’ve ever experienced. The drop across my bedroom floor was about a foot across the width. It always felt like I was walking up hill as I walked to my door. I turned down the wick as to starting early, and headed off later to see two of the people who appeared in my 2009 cycle. Their generosity and interest in my project originally had fired me up, when things hadn’t been going so well. 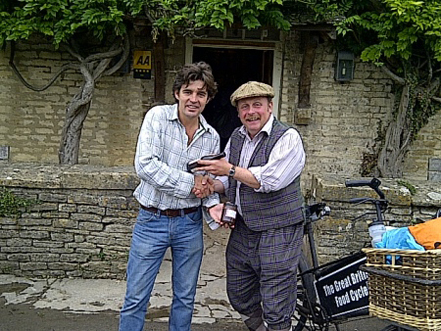 One was Archie, manager of the Swan at Swinbrook (near Burford) the other was Chris at the Upton Smokery on the Gloucester-Oxford border. I was looking forward to seeing them as they had motivated me on the first project and believed in the project enough to boost my batteries and send me on my way. This time is was a flying visit and as I’d broken my phone I hadn’t managed to call Chris in advance. I shouldn’t have worried as I turned up at the Swan pub to be greeted by Archie serving at the bar. He didn’t recognise me at first because I have grown a moustache on this occasion to go with the cycle ride. 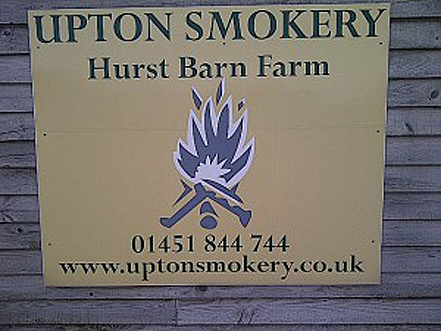 I stayed for a delicious salt beef & horseradish sandwich and a pint of local ale, then headed back on myself to Upton Smokery to chat to Chris who had just returned from a delivery in Birmingham and as usual he was generous with his participation giving several smoked trout fillets and a side of chicken. 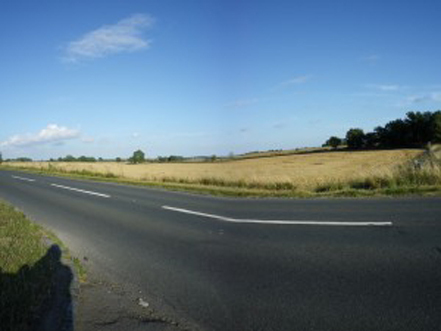 It was a good distant ride to Oxford from west of Burford. The weather was reasonable so I cracked on. along the A40 to Witney which wasn’t much fun, as it is a fast road and I had my closest call with a car. The guy was being a bit of a plonker and cut off my line in his favour on the exit of a roundabout cut across so close I couldn’t see the gap between my wicker basket and the rear of his BMW estate rear near-side wing. I’m guessing it was under 2″ I shouted, but it wasn’t as though he was going to care. so I cycled on. Behind a simple exterior hides a great resource. Farm shop too. After leaving Witney I cracked-on to Oxford down a nice cycle path, which took me quickly into the town centre. I hadn’t thought ahead on this occasion and there were multiple student groups visiting Oxford. At the YHA there was a single group of 50 forgeign students visiting for the week. All three hostels were fully booked and I was out of luck. After several days hard cycling I had become tired at my core. so booked into a more expensive B&B. It was fine, but when I get into town I don’t need luxury. I’m usually so bushed I only need a great bathroom and a comfortable bed. I went out for dinner, a couple of local real ales and home early to hit the hay. I took a day off in Stow-in-the-Wold it is so charming and for once it wasn’t raining on me. It was tempting to cycle durin g the fine weather but it was glorious to sit and enjoy the sun on my face without having to worry about arriving somewhere by a certian time. I had the pleasure of seeing Stow market square turn through its daily spectrum. From the YHA the hardy walker types were up with the lark and I could hear the firedoor stamming as they left at 07.30 next the holiday-makers and the odd business travellers checking out at 09.30 stragglers (like me) normally vacating as the clock strikes 10.00. By 10.15 the market square which holds perhaps 30-40 cars had all but emptied. A handful of locals waited for the irregular village hoppa bus into Moreton-on-the-Marsh or Chipping Norton. By 10.45 the square was buzzing again, and by 11, there wasn’t a parking space to be had. In the main retires and older tourists arrive to walk the stone pavements and admire the cotswold architecture. To window shop the boutiques and antique shops and to sup on every kind of cream tea imaginable. I went out to visit the local organic food store and enjoyed speaking with the many people who asked about Betsy and my event. It never ceases to amaze me how many times men of a certain age come over and immediately tell be of their experiences with a tradesmen’s bike. either baker, greengrocer or butcher’s bike. 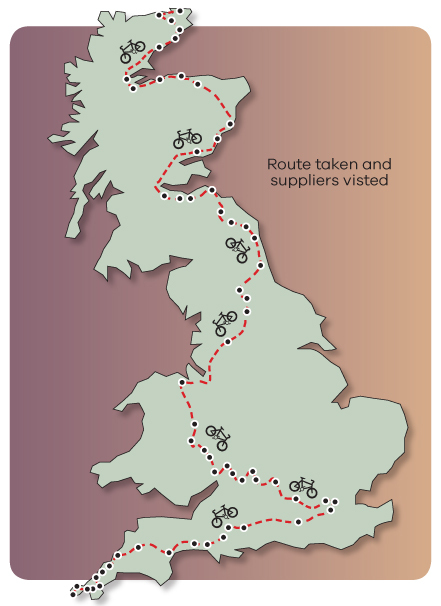 In my month on the road I must have heard twenty stories, the length of the country from men of retirement age or older, of how they cut their cycling teeth and earned their first wage making deliveries. Some of the most vidid and interesting tales were from men in Fifeshire, eastern Scotland who told of cycling in all weathers and the lousy brakes and the difficulty of ride when the basket is full. All of which three score years later, I am still finding. The only difference is now the cars & trade vehicles travel at four times the speed, yet Betsy & I are in the slow lane. Betsy was never designed to operate in the modern world. I stayed the night at a simple guest house the Spalite in Gloucester I hadn’t pre-booked accommodation and was lucky to find them through Tourist Information centre. I found the whole experience very efficient and at a great budget price. I left Gloucester around lunchtime, having treated myself to coffee and a sit down. A luxury for me, as I always seem to be on the move. Headed off towards Cheltenham, I went via a couple of the villages and somehow got lost. In a car the journey would be 20 minutes and almost impossible to get wrong. I don’t know how I did it, but I went in a big arch. 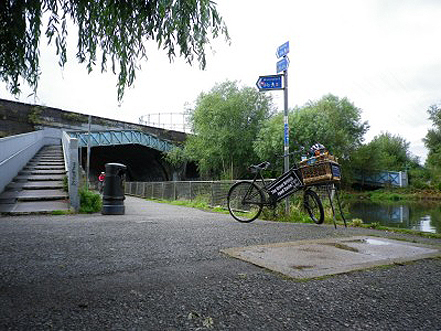 I got to see some charming hamlets and was very impressed with the cycleway in to Cheltenham. Although in the outlaying areas the road surface was rough for a cyclist. After an enjoyable spin round the city centre I contemplated cycling out to the Gloucester & Warwickshire Railway, north of the city to give me a lift up the Cotswolds. lucky for me I’d missed the connection and so had to cycle up the Cotswolds unsupported. It was a long ride out of Cheltenham but once I picked up the A436 the views got much better and the fast traffic got less. I was particularly happy because there were many apple trees along the roadside. Whether they were wild or had been planted by a far-thinking council or farmer, I don’t know but I stopped many times to taste the fruits. One (in a secret location) was deliciously crisp and sweet. I collected several of the small fruits to carry with me as sustinance, and moved on to the B4068. the sun was setting and the boys were gathering in the straw in the fields. In the distance the stormclouds brewed up a mess, but having pushed Betsy up hill for 25 minutes I wanted to enjoy the moment. The run down to Lower Swell from the A road is absolutely glorious. The sun was low and the distant rain clouds gave me incentive like no other. The road drops down to Lower Swell in a gentle gradient perfect for Betsy to manage. The steep climb into Stow-on-the-Wold was definately worth it. I was bathed in sweat and my shirt was ringing wet. I love to see people’s faces as a butcher’s bike rolls into town. Everyone is used to Lycra-clad cyclists and lumbering Winnebagos, but I often stop traffic as Betsy fully loaded with a tweed cyclist atop her is a real novelty. It’s especially satisfying after a long climb a 100lb bike is the last thing most people expect to see. I checked in to the YHA, happy knowing I was in safe hands. I enjoy staying with the Hostel Association. Great facilities and clean as a new pin in amazing locations. The Hostel in Stow is right on the Square. A picture postcard spot. I stowed my basket & cooked my supper. Then sat in the dining room over-looking the market square enjoying an ice cold Dunkerton’s cider as I looked out on this tiny Cotswold town fall sleep as the light faded. Bella and her husband and sons made me feel very welcome at their family home. With a great beef casserole and mash spuds from the garden and beans from the frame. With raspberries and cream to follow. Great home cooking. It filled my hollow legs. Then holy of holies they offered me the use of the washing machine. Oh joy! Some people speak of my tour as being spiritual or deeply menaingful. In the fullness of time that may come to pass, but when you’ve been cycling for weeks and trying to do your hand washing every evening after find food & a roof over your head, knowing sometimes you hand washing doesn’t dry before it has to be packed ahead of the next days’ cycle the spirituality of the event is lost in the moment. So the luxury of a washing machine and drying on a towel rail is closer to Navana than linking amazing British food producers with their communities. -Abbi & Carey Organics who contributed amazing garlic bulbs that were as large as light bulbs! I also got the opportunity to meet town mayor Cllr Alan Conway who was chatting with shoppers and stallholders about their thoughts on planning permissions lodged with the council by two local supermarkets to build new stores in town. Bella took a dollop of sourdough from my stash of Andrew Whitely’s starter, and we swopped a jar of Three Counties Gourmet mustard from her store cupboard. I was scheduled to meet with the Ledbury cyclists for an orchard tour & to be escorted back to town. Instead I arrived very hot & bothered having cycled over Haugh Ridge and was 2 hours late. The bluff is not for the faint-hearted, even on a lightweight touring bike, let alone Betsy with her foodie load. I had wondered why no-one had cycled out to Woolhope to meet me. Now I realise. The vast ridge dominates the skyline, and is a protected nature reserve for local flora and fauna. In turn the Haugh Ridge and the woodland shelters several villages from harsh weather, and contributes to a micro climate ideally suited to growing fine apples and pears. As you drop down from the high point, spectacular views of orchards galore are afforded you, laid out like a patchwork quilt. On an eighty year old bike laden with goodies it’s a hair-raising event descending to the valley floor. Gravel and run-off from the recent rain lay across the tarmac and the width of the tiny Hereford country road created a real challenge. Simon Day at Once upon a Tree, working in conjunction with Dragon Orchards has named one of his best creations a fruity icewine The Wonder, named after a landslip that after heavy rain moved off Haugh Ridge and remodelled the village with millions of tonnes of earth, destroying the local church and moving whole fields of sheep from one location to another. Briefly it became a tourist attraction in the late 19th century, I believe Simons ciders and wines will make their own movement of people in time. After breakfast with all the gang visiting British Cassis for Herefordshire food week, we ate well and headed out with Jo Hilditch to have a tour of her blackcurrent fields and see were the magic happens. We got to see 8 varieties of blackcurrent, grown & pruned differently spread cropping times & guard against being thwarted by climatic & pest challenges. British Cassis are always trialing new varieties. Before leaving after a tour of the bottling shed, I had the oppertunity to share some of Andrew Whitely’s sourdough starter with James the chef, who expertly crafted the meal from the night before. He was very pleased to try a new starter. I cycled over to Dunkerton’s to look at their operation. Just as i was leaving I looked round the corner to see Ivor Dunkerton out at the orchard with Susanna Forbes from Drink Britain chatting about cider apples. 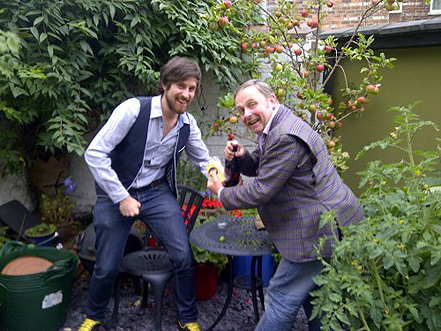 I popped over to say “hi” and we had a chinwag about apples and he admired my plus fours and cycle. I introduced him to Betsy and we chewed the fat for a while. I needed to push off as I had a long road ahead. 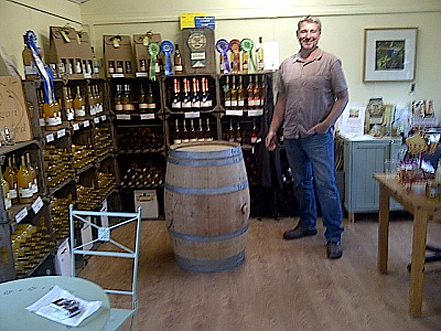 Andrew from Herefordshire Food Week, had recommended I visited Once Upon A Tree in Putley near Ledbury. I had a few technical problems so was a little behind the schedule. Several frantic tweets later and I arrived at Once upon a tree. unfortunately i was meant to meet a group of Ledbury cyclist that were to lead me back into nearby Ledbury. They had raided the farm shop & had a tasting then cycled back home with their booty. 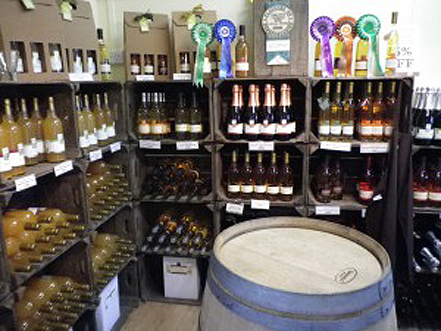 Simon very generously re-opened the farm shop and I got an exclusive tasting and i was rapped listening to his vision and how he can to produce single variety apple juices and hard cider. But for his in wine-making he is sculpting oaked ciders and fruit icewines. Superb, I know several people who will be interested in the uniqueness of his products. I cycled into Shewsbury with a concern Betsy was on the blink again. Since the Yorkshire Dales while braking very heavily on a 14% hill coming in to Pateley Bridge there was a ‘twang’ and there began a rasping noise from the rear hub. It steadily got more constant and my concern grew that something needed to be addressed. Because the bike is 80 years old everything is imperial and all modern bikes are metric. I have to find long established or very experienced mechanics. As I have the luck of the gods I found both in Shewsbury. 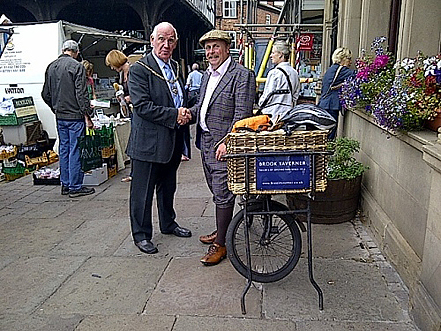 I was meeting Andrew Dawson, co-ordinator for Herefordshire food week with Hereford Council, keen cyclist & and all-round Joe 90. He put me up for the night after a couple of bottles of Shropshire Lad and local sausage & mash, which went down a treat. The next morning he pointed me to Stan Jones Bike shop in the heart of the old town. Within an hour Betsy had a new spoke and they had repaired the collapsed bearing. It’s not good as new, but doesn’t sound like a bag of spanners, and the coaster brake works again. I needed to get the British Cassis host for a gala dinner. 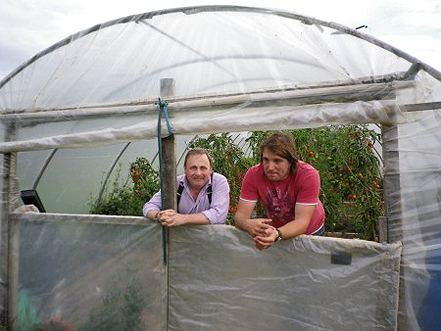 Celebrating Herefordshire Food Week. I have to travel almost 50 miles over varied countryside and only 6.5hrs to do it! I was on a long shot as they say. I had called & emailled without being successful in making contact. But my passion for all things best of British had me travel speculatively to see British Saffron. As far as I can tell British Saffron are unique in the UK in providing saffron grown in the British Isles. In the 18th century it would have been common to see fields of blooms in spring. Caer Estyn is somewhat off the beaten track and many of the properties are hidden in tiny valley locations. It took me 3hrs longer than expected to find the farm. Even asking a neighbour 200 foot away didn’t locate the un-metalled track. By the time I arrived I’d missed any opportunity to collect the hallowed strands. I cycled on disappointed not to make a connection, but not disheartened. I found the farm and from the looks of it, it is bountiful with lots heritage orchards or plum & apple besides the famous spice. Next time I will email, write, phone and maybe even carrier pigeon. 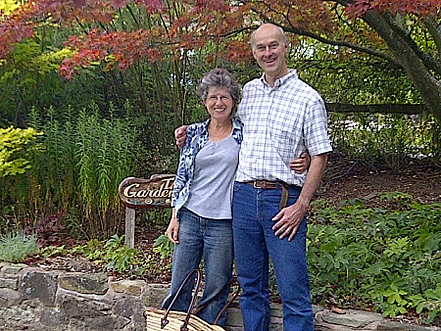 It was great to meet with Dan Hasler one of the brains behind The Moss Cider Project. I heard about them several months ago and thought I would get to visit this far-sighted inititive. Meeting in Dan’s yarden (as he calls it) he explained the origins of the project. Dan and some buddies are in the process of locating and cataloguing apple trees in the Mosside (and wider) area of Manchester, that otherwise would fall to waste. They obtain ripe apples and crush them for a fruit blend, both juice or a cheeky alcoholic beverage, that is available to special interest groups or local people by appointment. The profit goes back into the community and to expand the project. Dan explained they have big plans for the future. I expect to hear great things about this label. I hope to be able to put them in touch with other groups and professionals to aid their growth. 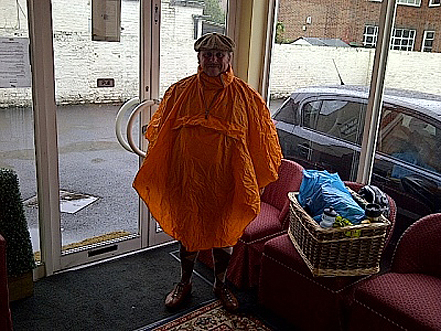 My stay at Masham was a wonderful surprize to me. 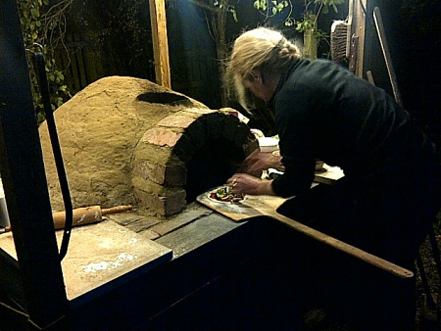 Wonderful home made pizza cooked in a genuine wood burning oven set in a beautiful garden. Thank you to Rhona & Paul for such a warm welcome and delicious food. Smokey pizza from Rhona’s oven made after she attended a course at River Cottage . The difference was awesome. I don’t use that term lightly. So fast and so much fun. I have cooked many times at my allotment, but my oven is not earth and wood burning. I have thought of such an oven, but it has been put on hold this year because of my cycle project. Now I see it must be resurrected, in favour of flavour! After some delicious home grown fruit crumble and another Black Sheep beer I went to sleep satisfied. Thanks guys, great work. The next day I was so impressed with the beer I had I went down the road to visit the brewery. Picking up some chutney with lack Sheep beer to strengthen the flavour.